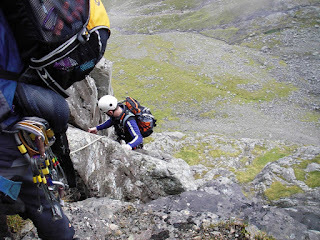 Tower Ridge - probably the best long scramble in the UK (Cuilin Ridge on Skye excluded) and a route that catches parties out every year resulting in an unplanned night out. It finishes near the summit of Ben Nevis and, if you want to add some "spice", can be started via the massive Douglas Boulder which takes the grade up from scramble 3 to climb D~VD. Always start very early. I planned to climb this route whilst my son hurtled down the Mountain Biking downhill course nearby and just days before we left I got a call asking if I'd guide clients on this. 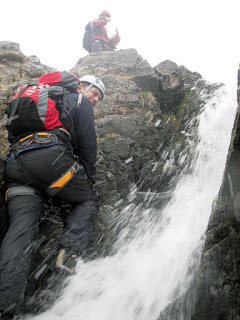 Years ago when training for my Mountain Instructor Award I was told that you'd know if you were ready if you could instruct anywhere in the UK, even if you'd not been there before so, after researching the route and weather, I was happy to take clients there. Sadly a last minute change saw me revert to plan A of soloing the route alone but during the walk in I met 2 experienced mountaineers planning to do the same route. I soloed up the Douglas Boulder (D~VD) as the other 2 climber roped-up below me. They weren't happy with the damp nature of the rock and so I dropped an end of the rope to help out and soon we were roped together. This turned out to be very fortunate as their rope was a few metres too short for the abseil down the back of this tall 'Boulder'. After that we were on the long main ridge and everyone was happy to move unroped so I went ahead up the ridge. A superb day and I met some nice guy's. The descent down to the Lochan and then on to the North face car park was wonderful and leg stretching - the new path is a great improvement. 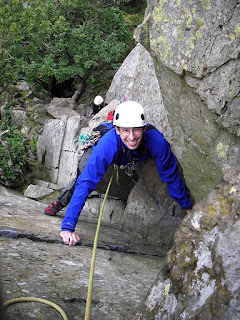 Richard is a teacher who comes to the Lakes with his parents and, whilst in the area, likes to grasp the opportunity to go climbing and improve his skills. 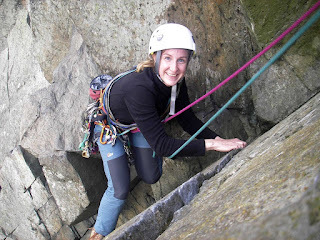 He'd never met Suzanne who gets out climbing a fair amount but often as a seconder (ie not leading) and wanted to improve her confidence and learn new skills. The 2 different experiences made for a great weekend with them learning from each other as well as from me, the instructor. The pictures show us climbing on Brown Slabs and later the same day on Little Chamonix. As a climbing instructor I find myself climbing certain routes quite frequently; this is because they are justifiably popular routes and clients understandably want to experience them. Little Chamonix is a superb route but beware - it has some quite exposed and steep parts for a VD (very difficult) graded climb and is a good quality route to have savoured. Sorry no photos of day 2 which I think was on. Wallowbarrow crag - I'll never win a memory competition! 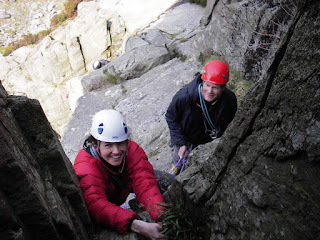 Nik and Carolyn have already completed a days "introduction to climbing outside" in the Lakes and are now on a weekend "learning to lead" in Snowdonia. By moving to different parts of the country they learn skills whilst experiencing different venues and rock types. Here they're climbing on Milestone Buttress in the Ogwen Valley. A wonderful crag not too far from the road but with an unusual feature - climb here when the RAF are practicing low flying in the mountains and you could be surprised by a jet flying past below you - it's quite unnerving at times. They've already booked a weekend later in the year so after practicing what they've learnt these days they can build more skills and confirm their practice period. 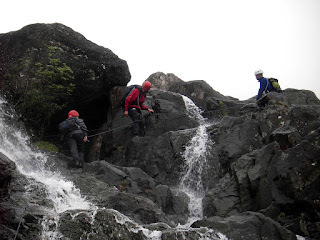 Scrambling in the Lakes, near Ambleside, in spring. We had a great day out, starting at the larger National Trust car park in Langdale, grabbing a bacon sandwich at the New Dungeon Ghyll, then heading up Stickle Ghyll. The weather was dry and warm so we scrambled up waterfalls and rock-hopped along the stream (so much more interesting than the path), using a rope wherever it got steep. 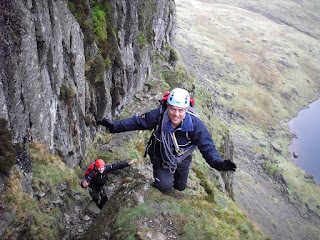 Then after stopping for a bite to eat at Stickle Tarn we headed up Jack's Rake where Andrew demonstrated his confidence. Jack's Rake is a justifiably popular scramble up the steep S.E. face of Pavey Ark. It takes a rising channel up through the steep clifs with serious rock climbs above and below. Beware, because although the route's not too hard the popularity of the cliff brings a lot of people hazards such as falling rocks and it can be slow going if you're behind an inexperienced or nervous group. Also it's worth noting that a slip out of the Rake would bring very serious consequences. For Nik's 40th Carolyn wanted to treat him to a Winter skills course and one thing lead to another and they asked a couple of friends along. They booked a nice warm bunk room in Roy Bridge (I've accommodation next door) and the next day, after sorting out winter boots etc with the ever helpful guys at Ellis Brighams, we took the easy option of the Gondola up Aonach Mor. At the top we practiced ice axe arrests, walking with (and without) crampons, considered the cracks in the cornice above Easy Gully and explored the summits. The 2nd day saw us in the Cairngorms heading up from Coire an Lochain into the white-out on the summits. Carolyn discovered an old snow shelter by putting her foot through it and we dug it out and crawled inside. On the summit plateau everyone had a go at navigating in the white-out as we headed over to a well known snow hole area to a variety of sleeping shelters before descending back into the Northern Coire's and a well earned drink in Aviemore. Day 3 saw us catching the 1st gondola up Aonach Mor before heading around the Nid into beautiful crisp (and cold) sunshine and blue skies. 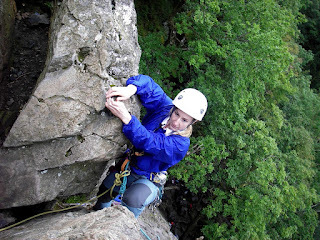 I hold the MIA, the top UK qualification for instructing rock climbing, scrambling, navigation etc.... I also hold the Winter & Summer Mountain Leaders awards & NGB recognised First Aid certificate.... 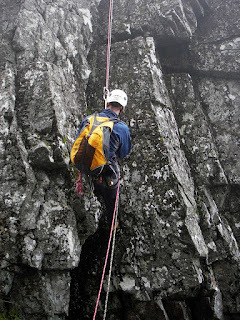 Between instructing & guiding I'm a technical product manager and worked for Petzl/Lyon and Lowe Alpine. Why not do a navigation course?